New Theatre you can buy your tickets here. In the announcement to bring To Kill A Mockingbird to the New Theatre as part of the 2014 program launch, Louise Fisher told the audience the New Theatre felt that given Australia’s current political climate, we needed a reminder of what was important and that certain messages, no matter how often repeated, simply were not getting through. (my paraphrasing) It is not by accident that New Theatre bring this well-loved play to the stage, it is not because we don’t know its story well enough, it is not because we need reminding of our school days and it is not because of Harper Lee or 12 Years a Slave. Unfortunately, it’s because Australian’s need to see it. It is because it’s message has not reached the hearts of the Australian populace and it’s because of its perfect resonance with this countries indigenous population and our treatment of sufferers from other countries who turn to us for help that we refuse to give. All Australian’s need to revisit To Kill A Mockingbird, because no matter how many times we may be able to recite the lines, we don’t understand it yet. Under the line “You never really understand a person until you climb into his skin and walk around in it”, it is not the good character of Tom Robinson (Craig Meneaud) that is under the microscope, rather the poor character of those who accuse him, and above all, the morality of a citizen jury that has power it can use if it puts away the blindness of prejudice and adheres to the laws of truth and decency. To Kill A Mockingbird is not the statement of a moral black population, it is the statement of an immoral white one, and it is in Bob Ewell that we see ourselves as Australian’s today. It is in Bob Ewell’s desires, his motivations, his actions and his expectations. That is why To Kill A Mockingbird is essential viewing for Australians at this crucial time in history; because we are behaving like a pack of Bob Ewell’s. 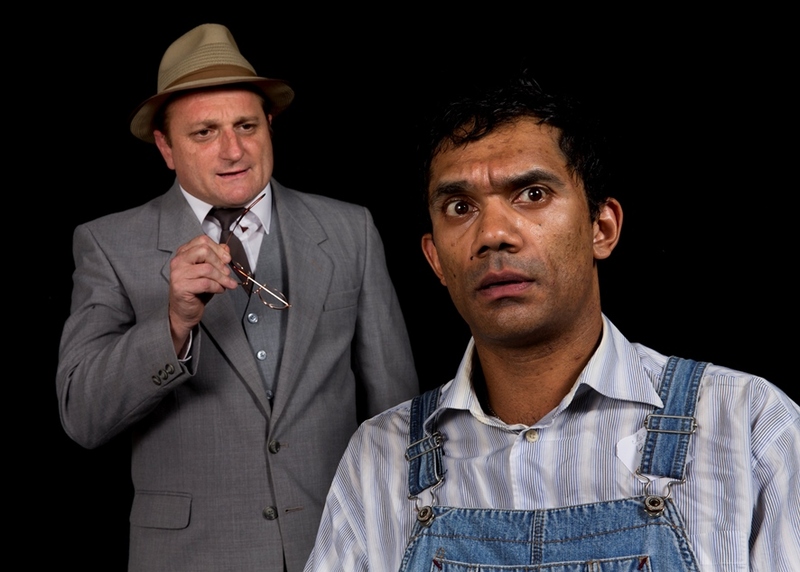 As far as stage presentations of To Kill a Mockingbird go, you’ll rarely see one as fine as is currently showing at New Theatre in Newtown. Despite Sasha Sinclair’s wonderful set, the tremendous performances and the broad relaxed warmth of the New Theatre, nothing gets in the way of the show’s central message encapsulated in Atticus Finch’s closing speech for the defense, the speech that begs from us (and the fantastic Lynden Jones speaks to us when he addresses the jury) an appeal to rationality and sanity over fear and emotional warmongering. Director Annette Rowlison points the entire play at this crucial moment portrayed by Jones with his only real rush of passion in a performance that is intelligently understated for the rest of the play. In the hands of Jones and Rowlison, Atticus Finch is not just a good man, he is an emblem of something that is possible, something to aspire to but something we do not have in this country. Of course, no matter what moral position one currently inhabits, the soul and thriving spirit of To Kill a Mockingbird is in the three children Scout, Jem and Dill. The three are played by Teagan Croft, Hudson Musty and Kai Lewins respectively in performances nothing short of astonishing in their consistency and confidence. Nine year old Teagan Croft particularly, who carries the weight of the show on her slight shoulders in her first theatre role is a revelation, as she not only gives us Scout with accuracy and a flawless accent, but spirited and buoyant performance also. Musty’s Jem is appropriately dark and brooding though ready to learn and Lewins’ Dill is properly wide-eyed and open to understanding. 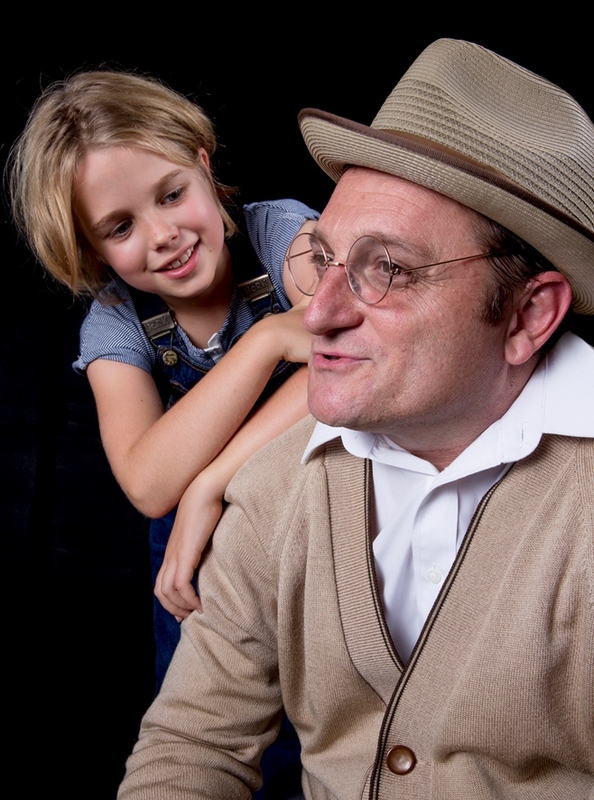 The children never let the production down and are worth seeing To Kill a Mockingbird for, along with Lyndon Jones who almost seems to be made to play Atticus Finch. Jones’ Finch is a wise beyond his ability to carry the burdens he is condemned to, and he’s played a little tired and a lot somber. If Atticus Finch is a star we all should be reaching for, Jones makes him as human as possible touching our hearts with his elegant beauty and touching our minds with his very human frustrations. 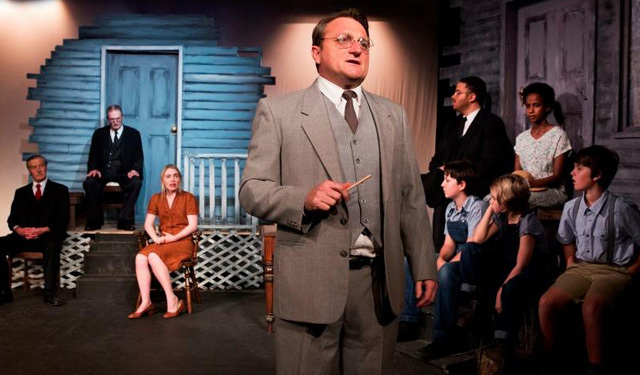 The rest of the cast does an excellent job in playing all their parts that bring Mockingbird to life. Craig Meneaud gives us a Tom Robinson filled with strength, integrity and appropriate fear, Dave Kirkham is a man who thinks fast on his feet as Heck Tate and Sarah Carroll gives the stage play the framework it needs as Maudie Atkinson. Katy Avery is a stand out as Mayella Ewell, performing more to her fears than to her racism, and Peter Maple is an excellent Bob Ewell, with his grinding anger and impulsive actions and more frightening than anything else, his ability to poison those around him with his hate. This is a simple version of To Kill a Mockingbird with no gadgets to distract and nothing fancy to trick us into believing Atticus Finch’s speech wasn’t for us. This is a straightforward production, an actor, a stage, an audience and an attitude so that there can be no mistaking the message all Australians need to hear.